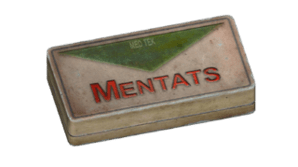 Berry Mentats is a Chems consumable in Fallout 76 (FO76). Players may use this item to regenerate health, cure Addictions and Diseases, slow time, temporarily change the player's SPECIAL stats and add various other unique effects. Many Chems can be bought from medical supplies vending machines. It's possible to become addicted to some chems, which will result in decreased stats until the addiction is cured. Berry Mentants, one of the developed flavoured variety of Med-Tek's popular drug Mentats. Originally, the drug was created to enhance mental related functions, but somehow, consumers would use it as a drug for their amusement - excessive use of the drug resulted to health complications, and its after-effects temporary leaves the user fatigued and somehow jaded once the drug wears off. This berry flavoured Mentants provides the user with an increase of Intelligence by 5 points and also highlights any living targets for 5 minutes.